On Sunday Max turned 17. I cannot believe how the time has flown by. And yet, most times that he had to have his leg in a frame, time almost seemed to stand still. I guess the saying "time flies when you're having fun" kind of makes a bit more sense now. I hate that the good times in life seem to fly by. We really have to remind ourselves sometimes to have as many good times as we can and actually appreciate those times even more when they do happen. We often have so much going on and for some of us it's difficult to focus on the good stuff but I think this can be said for most of us at some point in our lives. 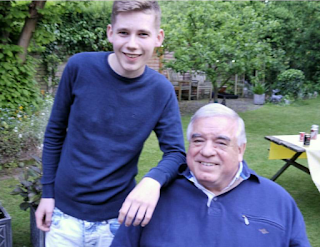 On Saturday, we enjoyed some lovely, sunny and warm weather at Max's grandparents' house for a family BBQ. I know that Max had a really lovely day so thank you to those that were able to make it. Matt and I were knackered on Saturday night! So we now have to start thinking about and planning for Max to start driving lessons. He's not yet ready as he is still wearing a plaster brace on his leg following his surgery last October, but hopefully only another week to go! Then it's just a case of getting the "driving lesson mortgage" sorted out. He is so very much looking forward to finally being able to start his college course in September. For those of you that don't know, Max would like to become a Conservationist. I think working at Durrell (Jersey Zoo) is his first goal. Who knows where it could lead? I love it that he is trying to follow his dream. We all know that there's not huge amounts of money to be earned in working with animals, but money is not the be all and end all. Living in a jungle, counting Orangutans sounds pretty damn good if you ask me. I'm sure they're a lot easier to deal with than most people in this world! Ha. But seriously, Matt and I (and others that know him too, of course), would have our hearts filled with such pride and joy to be able to see him achieve this dream. After all he has been through so far in life, he deserves all the happiness in the world. Max enjoying his BBQ with his "Popsey"
WORD OF THE DAY: Tickety-Boo, adj - British Informal: Fine; ok.